Over what should be a weekend spiked with creativity and carnage, Rockstar Games will be on the lookout for exceptional hair-raising Races and heir-erasing Deathmatches. 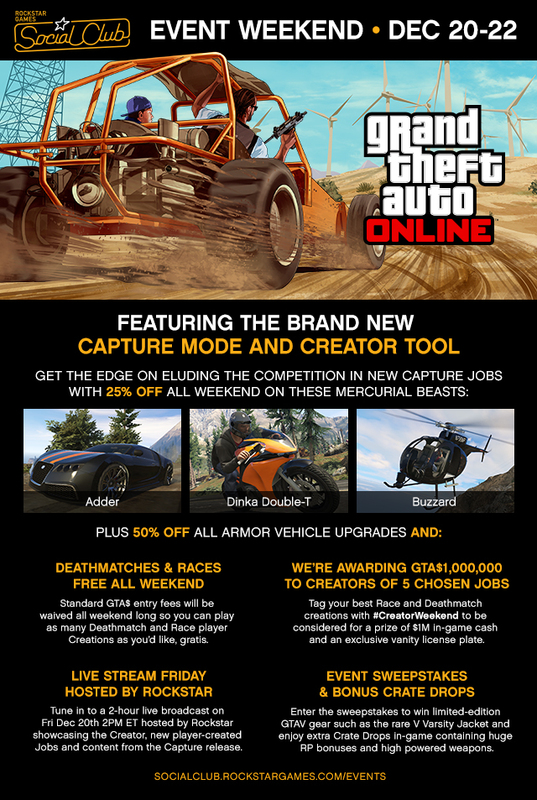 Jobs tagged with #CreatorWeekend before the end of day Sunday will be in consideration for a special prize of GTA$1,000,000 and an exclusive unique vanity license plate to use in-game (CRE8R, TOPCRE8R, NO1CRE8R, THECRE8R, I_CRE8). To submit your Job head to the GTA Online section of Social Club and search for the Jobs you have created. In the details area of the job you think is worthy, click the "Edit Tags" button at the bottom, add "#CreatorWeekend" to the edit box and click "Save". Five finalists will be picked in part based on the number of positive ratings they receive on Social Club, and also based on the discerning tastes of Rockstar Developers. See full terms and conditions. For some inside hints and tips on mastering the Creator as well as to watch Rockstar Games and others try out some of the best and most creative Jobs out there - and take on the community in the new Capture modes - tune in this Friday at 2pm ET at socialclub.rockstargames.com/events or at twitch.tv/rockstargames for a live-stream Rockstar-hosted broadcast. Members of Rockstar Games will also be online during the broadcast playing on both Xbox LIVE and PlayStation Network as PlayRockstar, PlayRockstar1, and PlayRockstar2 so feel free to look for them. Races and Deathmatches will be free entry all weekend to help you check out loads of the epic new Jobs created by the Social Club community. Claim an edge in Capture Jobs with 25% discounts on the Adder, the Dinka Double-T and the Buzzard, plus 50% off all Armor vehicle upgrades. If you've been weighing up an investment in high-speed engineering or some airborne firepower, this is the weekend to do it. And Event Crate Drops are back - frequent deliveries, with more than double the usual amount of RP, high-powered weapons and bonus cash! In the Social Club Event Sweepstakes, five lucky Social Club members will score a Grand Prize of Grand Theft Auto V gear including the rare GTAV Varsity Jacket as seen below. It's definitely one of the more on-the-money ways to ward off those winter chills. 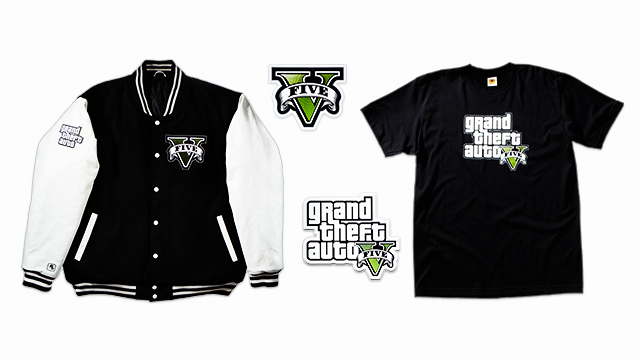 Five runners-up will get Grand Theft Auto V Prize Packs consisting of official GTAV t-shirts, stickers and more. You can enter to win all weekend from Friday December 20th through Sunday December 22nd at socialclub.rockstargames.com/events. See Official Rules. Lots of fun to be had! See you there and join us in the forums! 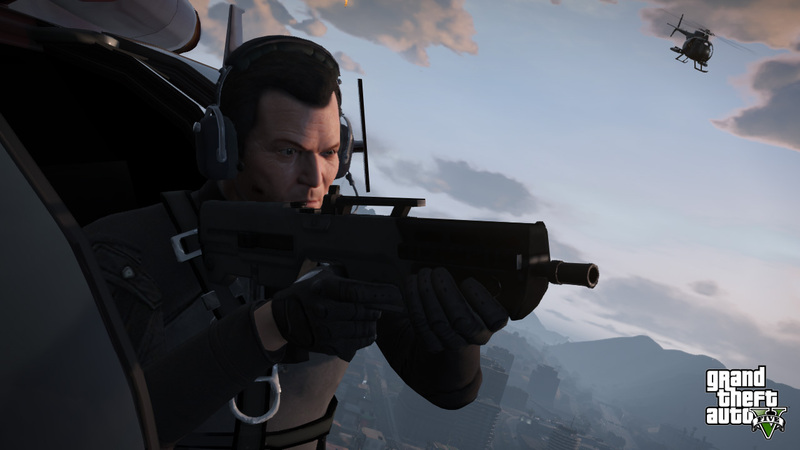 Rockstar Event Details: GTAO Weekend Dec. 20-22 - The latest Rockstar Games GTA Online Event is packed with fun and cool prizes.